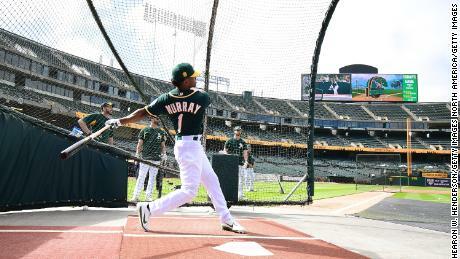 That’s exactly what University of Oklahoma quarterback and Major League Baseball prospect Kyler Murray did when he signed a $4.66 million deal with the Oakland Athletics this month. The 21-year-old junior will fight for a starting quarterback spot with the No. 3 ranked Sooners this season before joining the A’s in January. The deal pays Murray nearly the same salary as Oklahoma coach Lincoln Riley, who is set to receive $4.8 million this year. But he’s not letting the dollar signs go to his head — especially when more than 100 of his teammates are living off student-athlete stipends of a few thousand dollars each. By signing a professional contract, Murray lost his eligibility with the Sooners’ baseball team, where the outfielder batted .296 with 10 home runs and 10 stolen bases in 51 games last season. But NCAA rules allow college athletes to play professionally in one sport while maintaining eligibility in others, giving the No. 9 pick in the 2018 MLB draft another year of Division I football. Murray’s unusual situation is an eye-opener in an era where the push to pay college athletes from major programs in some form has gained traction. The A’s, meanwhile, reportedly received $210 million in revenues last year, while paying over $83 million in salaries. The fact that Murray, who stands at 5 feet 10 inches tall, is an undersized quarterback for the NFL could have made for an easy decision to commit to baseball. MLB contracts are generally fully guaranteed for a career that lasts, on average, 5.6 years, according to a recent study. NFL careers span just 3.3 years on average, according to the NFL Players’ Association. All drafted rookies are guaranteed four-year contracts. Depending on how his season at Norman, Oklahoma goes, Murray may rethink his commitment to the A’s — and Riley has left the door open for him to return for his senior year. Should he win the starting quarterback job from Austin Kendall, Murray will succeed last year’s Heisman Trophy winner Baker Mayfield, who he shadowed on the Sooners’ sideline last season. Mayfield, the No. 1 pick in the NFL draft, was signed to a four-year $32.7 million deal with the Cleveland Browns. 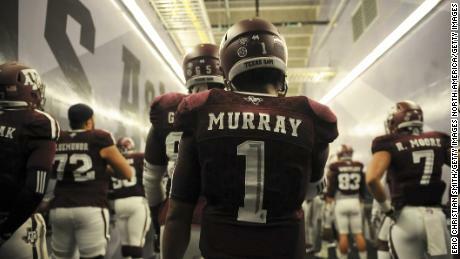 “I’ve been doing it my whole life,” Murray, who previously played quarterback for a season at Texas A&M, said of competing for the starting spot. In limited action last season, Murray threw for 359 yards and three touchdowns, while rushing for 142 yards, including a 66-yard breakaway against West Virginia in his lone start. Murray is represented by Scott Boras, who virtually guaranteed his client’s return to the A’s. Boras previously negotiated deals for Alex Rodriguez worth an estimated $480 million. Murray follows the footsteps of other notable two-sport standouts. Seattle Seahawks Super Bowl MVP Russell Wilson played minor league baseball for the Colorado Rockies, but reportedly returned part of his $200,000 bonus so that he could pursue his NFL career. Former Heisman Trophy winner Tim Tebow played three NFL seasons before switching sports. He has been in the New York Mets farm system since 2016, but suffered a season-ending injury, breaking his hand in July. The most famous examples of baseball-football dual athletes in the modern era are Dion Sanders and Bo Jackson. Jackson, a speedy running back, played four NFL seasons with the Oakland Raiders. He suffered a football-ending injury in a 1991 playoff game, but extended his MLB career to eight seasons. Pro Football Hall of Famer Sanders won two Super Bowls as a cornerback and played in the 1992 World Series for the Atlanta Braves. Meanwhile, Charlie Ward, who won the Heisman Trophy as Florida State’s quarterback in 1993, turned to the NBA. He enjoyed a 12-year career as a point guard which paid him over $34 million.